Feeding: It is important not to over feed the Chinese Crested as they have a tendency to become obese. Temperament: The Chinese Crested is an intelligent, sweet, happy, lively, playful, cuddly, alert dog. Family Dog: The Chinese Crested is great with children. Children should be taught to be gentle with this breed because it does not have the protective coat of other breeds and can be injured easily. They are typically good with other household pets. Shedding: The Hairless Chinese Crested sheds little to no hair which makes them a great choice for allergy sufferers. Grooming: The Hairless Chinese Crested is a very clean and odorless breed. They are not prone to getting fleas or ticks because of their lack of hair. The Powder Puff requires more grooming including daily brushing. Extra care should be given to the wooly undercoat which can become matted if neglected and during the heavier shedding periods. The Hairless should be bathed frequently and oil or cream should be used on the skin to keep it soft. Training: The Chinese Crested should be well-socialized when young to avoid becoming scared and timid adult dogs. If properly trained they have an ability to learn and perform tricks. Barking: The Chinese Crested is not known as a barker. Weather: The Chinese Crested should wear a coat or sweater when going out in cold weather. Exercise: The Chinese Crested is a very active little dog that needs a daily walk and enjoys playing outdoors in a safe open area. Living Conditions: The Chinese Crested make a good apartment dog as they are fairly active inside and do not need a yard. Appearance: The Chinese Crested is a fine-boned, elegant, graceful toy dog. This breed comes in two distinct varieties the Hairless and the Powder Puff, which are often born in the same litter. Either variety of this breed makes a wonderful loving, playful, entertaining, companion dog. Size: The fully grown Chinese Crested should be between 11 to 13 inches tall with a weight not exceeding 10 pounds. Companionship: The Chinese Crested is a wonderful and entertaining companion dog that craves constant companionship. Head: the Chinese Crested has a wedge-shaped skull that is slightly arched between the ears with a slight yet distinct stop. The Chinese Crested has an intense, alert expression. Nose: The color of the Chinese Crested's nose resembles the dogs overall color. Eyes: The eyes of the Chinese Crested are set wide apart and almond-shaped. The shade of the dog's eyes and eye rims should match the shade and color of their body. Ears: The Chinese Crested's ears are large, erect and left naturally uncropped. They should be set in such a way that the base of the ear is level with the outside corner of the eye. Muzzle: The length of the Chinese Crested's muzzle is approximately equal to the length of the head with the cheeks tapering cleanly into it. The lips should be clean and tight. Teeth/Bite: The Chinese Crested should have a scissors or level bite. The Hairless variety has the ancient style of canine teeth called 'tusks' which actually point forward in their mouth. Neck: The neck of the Chinese Crested should be lean and clean with a slight arch allowing the head to be carried high. Body: The body of the Chinese Crested is rectangular in overall proportion meaning the length of the body is slightly longer than its height. This allows for ample freedom of movement. The body has a slender appearance and should not appear too refined and breakable nor robust and heavy in structure. The topline should be level or have a slight slope toward the rump. The ribs are well-developed with the brisket extending down to the elbow. The depth of the chest gradually tapers toward the back with moderate tuck-up. The breastbone should not be too prominent. Forequarters: The Chinese Crested's shoulders are clean and narrow with ample lay back, at approximately a 45 degree angle to the point giving the dog good reach. The legs are long, straight and slender with the elbows close to body. The pasterns are strong and upright. Hindquarters: The hindquarters of the Chinese Crested should have moderate angulation with the hock joint perpendicular to the ground. Gait: The Chinese Crested has an agile, smooth, straight and lively trot that should be neither stilted nor hackneyed. Feet: The Chinese Crested has hare-like, elongated, narrow feet. The nails should be maintained at a moderate length and the dewclaws may be removed. Tail: The tail of the Chinese Crested is slender, tapering to a curve toward the end. It should be long enough to reach the hock. When the dog is in motion it is carried gaily and may curve slightly over the back. When the dog is at rest the tail should be down with a slight upward curve at the end. The Hairless variety has a long feathered plume that covers approximately the last two-thirds of the tail. The tail of the Powder Puff variety is completely covered with hair. Color: The coat of the Chinese Crested can consist of any color or color combination. Coat: The Hairless Chinese Crested is not completely hairless it has hair on certain portions of the body. The hair on the head or crest begins at the stop and continues down to the base of head and back of the neck. There may be hair on the ears and face. The tail is covered in hair in a plume-like fashion. The feet from the toes to the front pasterns and rear hock joints are covered in hair called the socks. All the hair is flowing, can be any length and has a soft and silky texture. The hair gradually tapers off to a smooth, soft skin where there is no hair. The exact location of the hair is second to the type and texture of the hair which is the most important characteristic in this variety. The Powder Puff Chinese Crested is completely covered in a soft, silky, double coat with long thin guard hairs covering the short silky undercoat. The outer coat is straight and of moderate length and density. 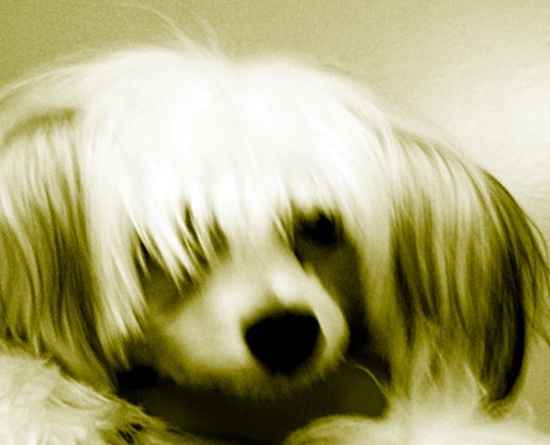 Life Expectancy: The average life expectancy of a Chinese Crested is 10 to 12 years. Characteristics: The Chinese Crested has a tendency to become attached to their owners and will not adjust easily to a new one. They like to climb and dig holes. The gene causing the hairlessness is dominant, meaning that if the dog has this gene and the one for hair it will be hairless. This gene is fatal if the dog has a combination of two of them. As a result it is very common to see both the Hairless and Powder Puff varieties in the same litter. Allergies: Many Chinese Cresteds have an allergy to lanolin and wool. Health: The exposed skin of a Chinese Crested requires special care and attention to prevent problems and irritations. It should be protected with sunscreen when outside. Dental Health: The teeth of a Chinese Crested should be well cared for to prevent decay as the gene causing the dog to be hairless also causes an increase in tooth decay and dental problems. As a result, it is advised not to give your Chinese Crested bones to chew. The tusks of the Hairless variety are usually the first teeth to go. The Powder Puff variety typically has a full set of normal dentition. History: The Chinese Crested was originally called 'African Hairless Terriers' after their homeland of Africa where they originated. The Chinese trading ships stopped in Africa along their routes and picked up some of these dogs to be used as ratters aboard their ships. Not surprisingly it was the Chinese who gave them their current name, 'Chinese Crested'. This breed was first shown in the west in 1885. It was not until 1979 that the first breed club in America was established and they were not recognized by the AKC until 1991. In both the United Stated and England, the Chinese Crested has gained popularity since then. Today, they are kept as companion dogs and are frequently shown in rare breed dog shows.